One of the frustrating things about shin guards is the way they're constantly slipping down your leg while you're playing soccer. Unless you have a very expensive pair of shin guards, you're going to struggle with keeping these pads in place. And while socks are intended to help support shin guards by keeping them tight against your legs, most of the time this just results in your socks going down with the shin guards. But there is an easy way to keep your shin guards up: by using tape. Slip on your socks. 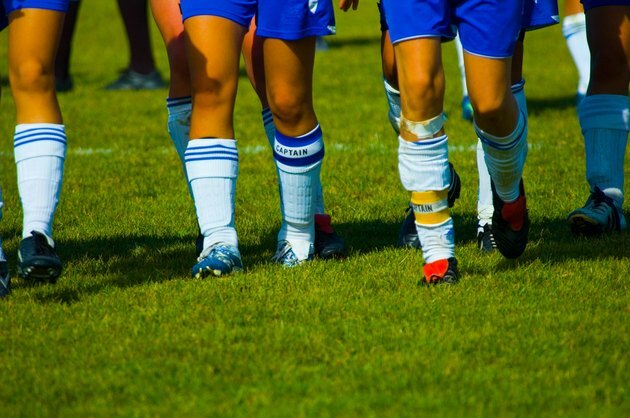 Place the shin guards under the socks in position on your leg. Readjust the shin guards if necessary. Unroll the tape and wrap it around the sock just the bottom of the shin guard. Wrap several full rotations around your leg, making sure that the tape is tight but not restricting blood flow. Tear the tape from the roll and smooth it onto the wrap. Unroll more tape spool and apply it to the sock between the calves and the knee, above the shin guard. Tape several rotations around your leg, then tear off the tape from the roll. Repeat on your other leg.